instead and visit WA state. I've never been to Seattle so it'll be a nice vacation. I shouldn't feel bad considering we just went on a trip to Washington D.C. a few months ago. I'm luckier than a lot of people. Many don't have the time or resources to go on vacations so I shouldn't be complaining. Anyway. . .here is a card I made this morning. I didn't do much stamping today and won't probably get to do any until late tonight. We're planning to BBQ in our backyard and just hang out. This card is a tri-fold card with a window. 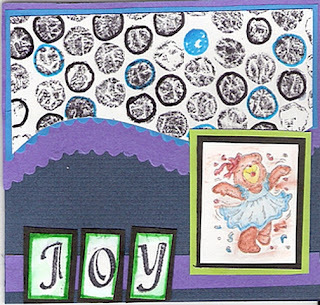 I made this card for Jen's Sketch Challenge at "Pieces of Me". She has a 10K Challenge going on as well and you still have time to participate in that one. Today is the last day for submissions for the sketch challenge but I think I still have time to squeeze this one in. I started off initially not knowing what to create but I sort of played around with a few embellishments to see how it would look and I decided that the big prima flower fits into the theme. There was no rubber stamping with this card. I printed the sentiment from my computer because I didn't have a "summer" sentiment. The card opens up to the second panel. The second panel is a half panel. I decorated the panel with the same DP as the front and added the sentiment and ribbon. The sentiment shows through the window of the front. This is the card completely opened up. I was going to add a lining but got lazy and decided to leave it the way it is. Hey Good Morning Everyone! Hope your day is starting off good. I don't know. . .I feel a bit moody today! We had planned to go on an Alaskan Cruise in August but one of the stops with the particular cruise that we were looking at, stops in Canada. Unfortunately, we don't have our passports. We're going down to the passport place today to see if we can expedite the application process. My husband and I talked about this cruise for months but he always seem to be undecided. Finally, he decided he wanted to go. . .I called the travel agency and the girl told me that most of the cruises were booked. She did find one that fit our requirements but it turns out, we need our passport. My husband is always undecided about everything and unless I push things along, he doesn't make a decision. . .now, that he decides to go, we probably can't go. Another problem cropped up. . .the travel agency said that we need to secure payment today and my husband said "I don't like the idea that they're pressuring us to pay today". What's the point of going to the passport place to get our passport. . .I don't think we'll end up going anyway. I'm annoyed because I was supposed to go to the SU Convention but my husband told me that I had to choose between the Alaskan cruise or go to the SU Convention. I chose the cruise. . .well, you know how the story goes. Anyway, on a happier note. . . I made this "gate" card last night for my TIC. Just another idea for a tri-fold card. It opens like a gate at the center of the card. I added a sentiment to the left flap on the inside of the card. Look at Tejal's beautiful tri-fold card. I love that window portion of her card. Isn't it great! Tejal is a wonderful gal from India. . .can you believe it. . .the world is stamping, just like us here in the US and Canada. Tejal is a wonderful trooper participating in my card challenges! I really appreciate it. Be sure to stop by her blog site "Creating New Expressions Everyday". 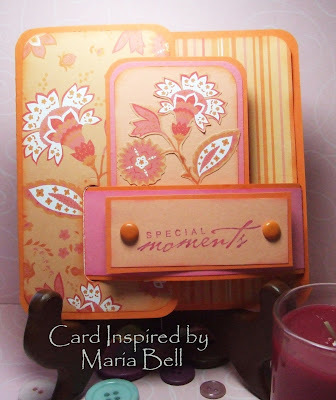 She has wonderful card creations to share with all of you! This is the inside of Tejal's tri-fold card. Hey Everyone. . .check out Monika's tri-fold card. Beautiful, isn't! 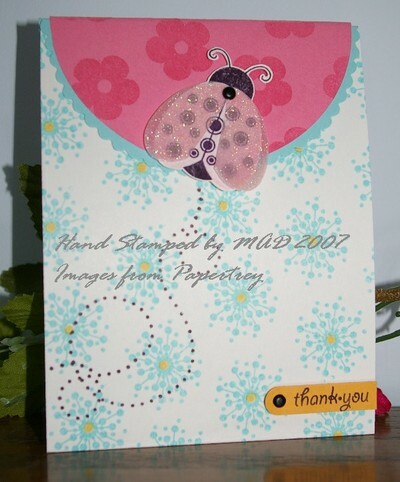 I just love her card design, especially the image of the Paper Trey ladybug. Isn't it pretty. Looks like Monika's card has a top fold. Check out Monika's blog site "M.A.D. Stamper" for other great inspirations. Monika makes such beautiful cards and she participated in my last TIC too! Fabulous. Thank you Monika for participating again. Hey it's Jen again! She made this fabulous tri-fold card! 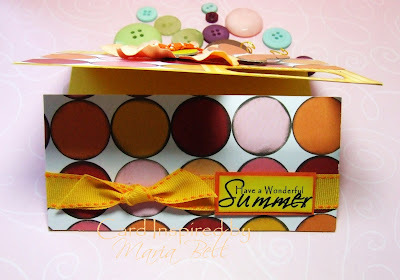 Gosh I love all the pretty summer colors she used! The bee stamp is the cutest. I think that'll be the next stamp I'll buy. Jen always makes such lovely cards. Be sure to stop by her blog site "Pieces of Me" . . .she has a RAK Club that she started. I decided to participate! Sounds like fun. As always, thanks Jen for participating in my TIC. Your cards brighten up my site! This is Jen's card opened up! This is my submission for my TIC. This is a tri-fold card because it has 3 panels. I'm really having fun with my own challenge. . .haha! It "forces" me to come with different types of cards when I normally go the easy route and make a regular A2 card. Anyway, this card was created using the "Big Buckle" Technique. . . Click here for the tutorial on SCS. 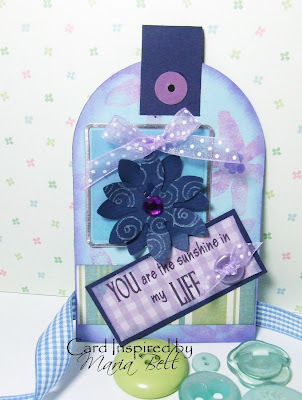 Try it out. . .it's an easy card to make and it's fun! To create the slot, you either need to cut it yourself or do it the easy way and use the SU Word Window Punch. It's a fabulous punch and I use it for all sorts of projects. Not much stamping with this card. 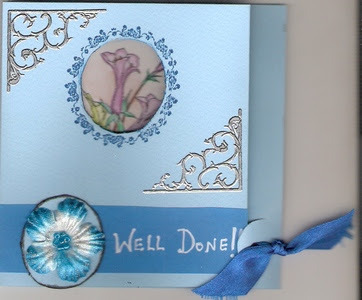 I cut out one of the flowers from the DP so it would match the backround and used that as my focal image. . .the rest of the card is basically cardstock and designer paper. This is the card with the buckle removed from the slot. It reveals the focal point in the center. This is the card opened up completely. Here is the sketch for the card. Whoohoo~ Check out Gabby's tri-fold card. Wow! Isn't it awesome! I love the scallop oval shape that she used and that Bella is so cute. Gabby is the group manager of "Handmade Cards with Love" a card-making and stamping group site that I'm part of . If anyone is interested in creating this "Triangle Tri-fold" card, there's a tutorial on SCS . . .click here for the tutorial. Thank you Gabby for your awesome submission! It will surely inspire someone to create a similar card! This is how the card looks when it is opened up. Hey Everyone! This is the first submission on this blog site. I already have a few on Stampin Inspirations. Whoohoo! 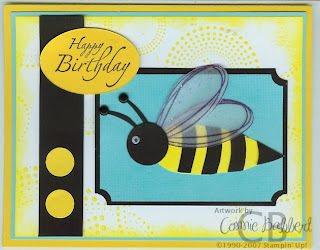 This lovely card is from Beth at "Sunflowers and Dragonflies"! Isn't her card awesome! 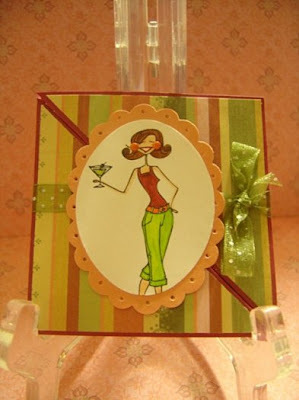 Check out the details of this card on her blog site. Well this is a "gate" tri-fold. . .it's amazing how many variations of tri-folds there are! Beth did a wonderful job coloring her bunny, who by the way is such a cutie! Thank you Beth for participating in my TIC!! 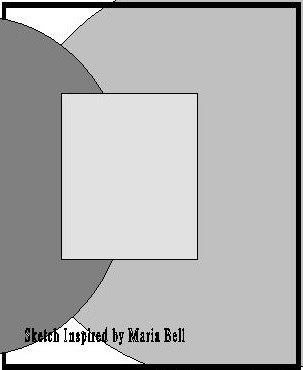 If you're interested in participating in my TIC Day #2 - (Tuesday's Inspirational Challenge) Tri-fold Cards . . .click here for the details! I'm adding my own submission for my TIC because it's also a challenge for me. It pushes me to make cards I typically am too lazy to normally create. . .:) It would be great if y'all try it out and send me a picture of your card so I can post it on my blog site. Click Here for the details of the challenge. This is a matchbook style tri-fold card. It's still a tri-fold even if the 3rd panel does not open up. Technically, there are 3 panels. 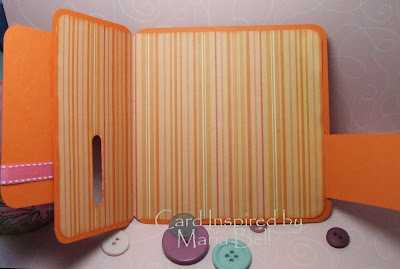 The front panel tucks into the 3rd panel which is used to keep the card closed. 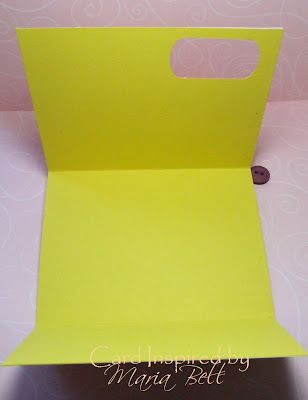 When opened, the inside has an insert that a personal sentiment can be written on. 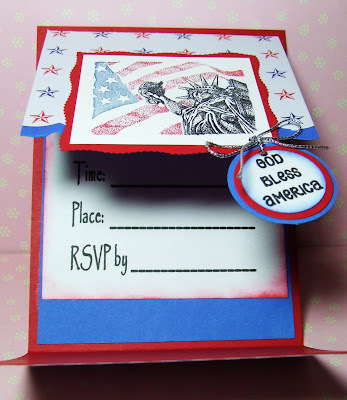 My card has an insert that has a stamped sentiment inside as shown below. Stamps: All Night Media #460H and the sentiments are by Anna Griffith stamps. This is the inside of the matchbook style tri-fold. Here is the sketch for this tri-fold card. Hello Everyone. . .This is my own submission for my TIC Day #2. 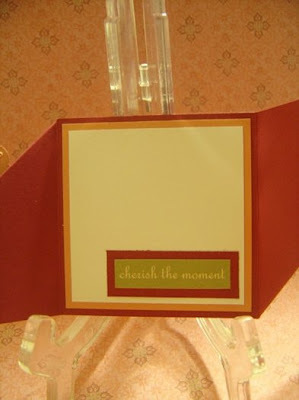 I just wanted to add an idea for a tri-fold card in the case you are stumped as to what to create. On this card the left and right panel are cut into a round shape. With the right panel, I cut the edge using Fiskar "Victorian" scissors. 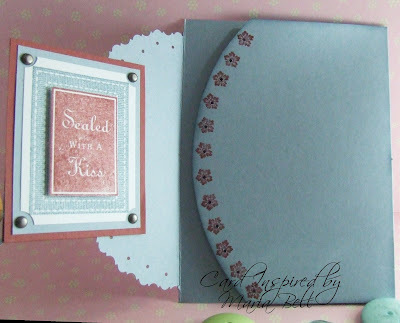 I stamped the small flowers on the rounded edge and punched a hole through the flowers. The stamp set used is an Anna Griffith stamp set. I stamped the image using SU Bordering Blue and Cranberry Crisp. The same color combo was also used for the cardstock. The corners were punched with SU Ticket Corner punch and the pewter brads by Making Memories. An organdy ribbon was used as added embellishment. 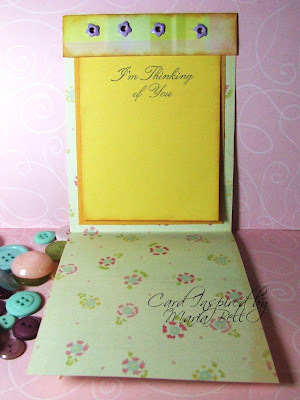 Check out Stampin Inspirations for more samples as well as two cards submitted by my readers. It would be lovely if you would send me a picture of your card. For details on my TIC. . .Click Here. The flowers were stamped and a small punched through each flower. The card opens up to reveal a side sentiment and an inner sentiment. Here is the sketch for the tri-fold card!! TIC Day #2 - (Tuesday's Inspirational Challenge) - Three Way Baby!! Hey, Hey Everyone! Calling all participants. It's Tuesday and it's Challenge time. 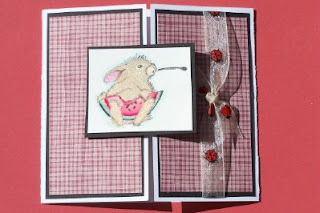 This week's TIC is "Three Way Baby". . .haha. . .I know that sounds a bit nasty but in the stamping and card making world all it means is to create a tri-fold card or project! Okay, so get your mind out of the gutter. Card or project needs to be a tri-fold card meaning 3 card panels. It can be of any size or any shape. The panels can be of differing size or shape. No more than 3 panels. Let's stick to 3 folds only. The panels can overlap one another, accordion style, or open door type. 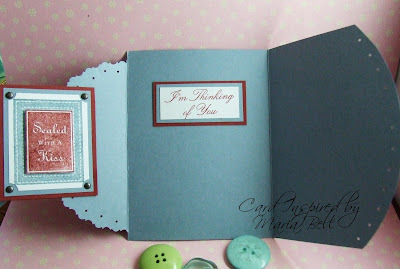 Cards or projects don't have to be limited to rubber stamping. 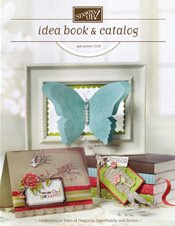 Paper piecing, drawn images, scrapbook embellishments are also accepted. Okay. . .let's have fun. The pictures of 3 panel cards or tri-fold type of cards. The first is a vertical fold, the second card is a horizontal fold, and third is a "matchbook card" that don't open up to reveal 3 folds. The front panel tucks into the 3rd fold but it meets the requirement of a tri-fold. On Monday, I will randomly choose a winner to receive a SHARE/RAK card (one of the cards I'll make for this challenge). Just a simple way to say "thank you" for participating in my TIC!! 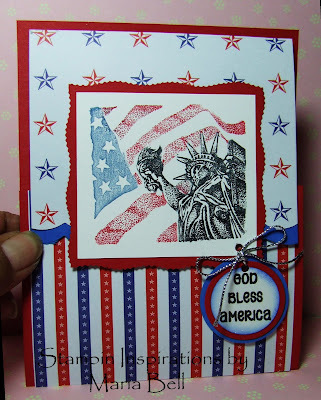 Cards made with Stampin Up stamps (primary or focal image) will be posted on my Stampin Inspirations blog site and cards made with images other than SU will be posted on Card Inspired. This is a vertical tri-fold. . .as you can see 3 panels. This is another tri-fold with a horizontal fold. This is a matchbook card. The front panel folds into the 3rd panel but don't open up to reveal 3 panels. It still qualifies as a tri-fold. 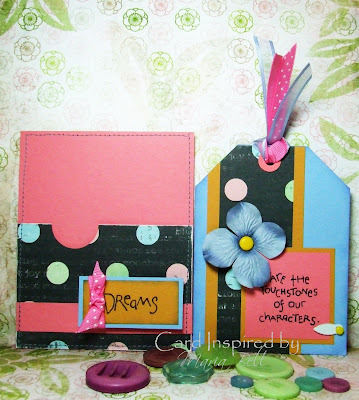 Today's Daily Special is "Anything But Cards" and the project is a "Tag Scrap/Brag Album". This album is dedicated to my grandmother and my daughter Alexis. The pictures are of my daughter from age 2 to 4 years old. 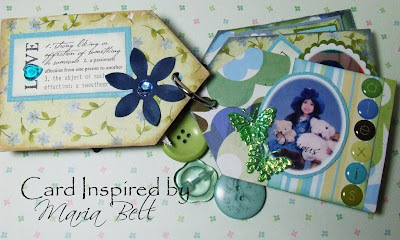 I haven't posted any cards or projects for the last few days because I've been busy making this tag scrap/brag album. I've also been sketching and drawing. Why am I drawing? Trust me, it's not by choice. I'd rather be making cards. I've restricted my kids from playing on the computer and video games. In order to play on them, they had to draw or write a poem on a subject that I chose or they don't play. They complained that I should also have to draw something. . .so I did. I'm almost done and I'll post a picture of my drawing once I've completed it. Working on the drawing and this scrapbook, took away from my card making. Arggghhh. Anyway. 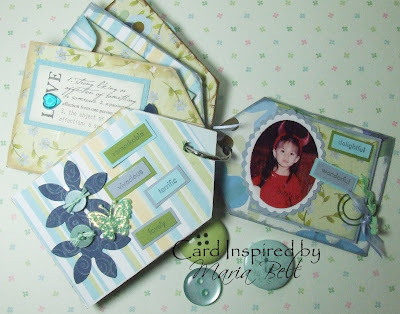 .I'll be making few more of these mini album in the next few days. . .one for my son, my husband, and me. Sorry. . .the pictures didn't come out too well. . .my OTT light don't work as well in the day time for some reason. . .I think because it competes with the natural sunlight shining in my room. Scroll down for the rest of the tag album. The sentiment to the left is "Definitions" by Making memories, the metal alphas are by Colorbok - from a scrap value pack I bought from JoAnn. These scrap value packs are great because they're very cheap with tons of goodies in it. The coin envelope to the left has a tag inserted inside with my journaling. I posted a picture of another coin envelope located at the end of the album. . .it also includes a tag with my journaling. . .scroll down for the sample. The flower was created using a Marvy flower punch, the sentiment to the left by Making Memories, and the epoxy stickers are from a scrapbook it by Ki Memories. The rhinestones are by Darice. This is a picture of my daughter at age 3. The sentiments on the envelope to the left are stickers. . .the sentiment "Perfection" is by Making Memories and the flower charm hanging off the sentiment is also by Making Memories. 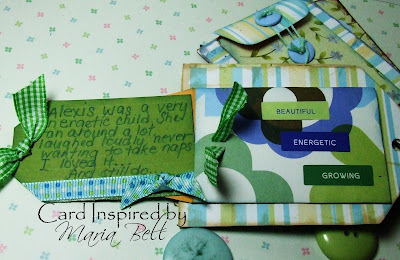 My journaling on a tag inserted into a coin envelope that I decorated with designer paper. The sentiments are stickers. The ribbons are by American Craft Elements. The last page. . .my daughter the little devil. TIC Day #1 - And the Winner is. . .
Hello Everyone! Thank you for all the participants of my first TIC! 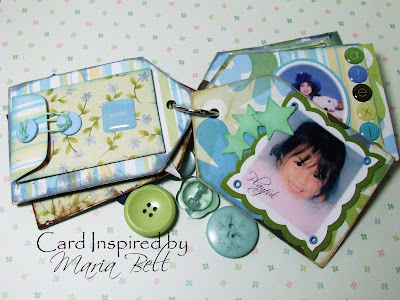 I had so much fun with this challenge. . .it helped me to work a little harder in creating multiple layered cards. For those who participated, all of your work were wonderful and I hope you'll come back for my next challenge. For those who didn't have the chance to participate, I hope I'll see you on my next challenge!Anyway. . .now for the winner of the RAK (it's not necessarily a RAK because you had to do something to receive it). I'll be sending a handmade card that I created for the challenge. I guess you could call it a SHARE rather than a RAK. I used a random selector generator to choose the winner. The winner is JOYCE. Congratulations! See y'all next time. 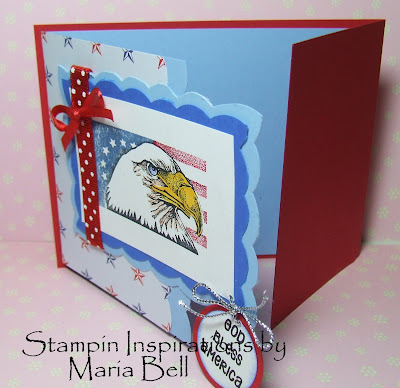 . .
For some reason, today's posts are not showing up on Stampin Inspirations. Card Inspired appears to be working fine. I don't know what the problem is on Stampin Inspirations! I'll check back later to see if my posts show up! Just another tag I made using scraps that I had in a bag. I have a lot of left over stuff that I sort of put in a bag. You know, open packs of stickers, cut up tags, pieces of ribbons, etc. 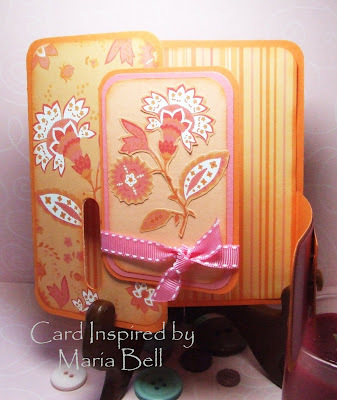 The flower was created from a flower die cut and I stamped swirls on it using SU Vanilla Craft Ink, the square at the back of the flower is a metal tag, the sentiment was an embellishment I created by printing on scrapbook paper. The ribbon is by Dashes, dots, and checks. 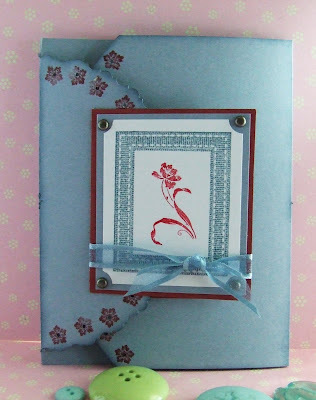 The stamped background is from the SU "Flower Fest" stamp set. 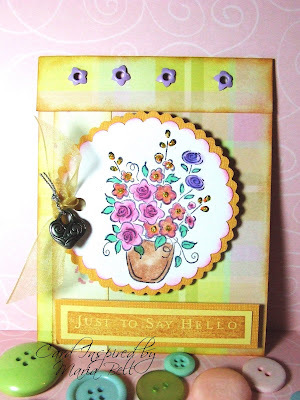 I stamped the image using white craft ink and colored the flower with pastels. This tag fulfills the TIC - 5 Layers Minimum requirement. It has 9 layers. Today is the last day to submit your TIC card so hurry! I'll continue to accept submission until 12 midnight. Hope y'all are having a wonderful Sunday!! Today's Daily Special is "Tag Time". 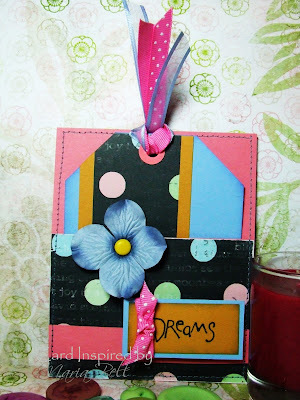 On Stampin Inspirations I created a tutorial for creating a No-Brainer Tag Pocket. This is the same tag pocket but instead of using eyelets to secure the pocket, I sewed stitches around the pocket to secure it. I punched a half circle on the front of the pocket so that flower can slide in place to be revealed in front of the pocket rather than tucked inside of the pocket. Check out the picture below. Do you see how the pocket don't have the flower when the tag is removed. It's just a fun way to reveal the embellishment when the tag is inserted into the pocket. If interested in creating a really easy tag pocket. . . This tag also fulfills my TIC - 5 Layers Minimum. This tag has a total of 6 overlapping layers!! This is another card I made using "scraps". 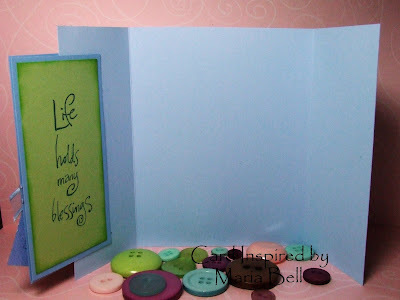 The square shape background was made with cardboard (from a box) cut into a square and I covered it with scrapbook paper. It actually looks like chipboard. The sentiment embellishment was something I made 3 years ago and stuffed into a bag and never used. I printed "Celebrate Today" on a piece of scrapbook paper, sewed on organdy ribbon over it using a zig-zag stitch and cut the edge with Fiskar's "zig-zag" scissors. The flower is a die-cut that I cut with my Craft Robo and paper pieced the stems and leaf. I also cut the scallop circle with my Craft Robo. The small flower is an embellishment by Jolee's by You which by the way was sticking to the side of a plastic bag that I had stuffed into a container. The DP is by Colorbok and the ribbon is by American Craft Elements!! This card satisfies my TIC because it has 7 layers including the stitches. 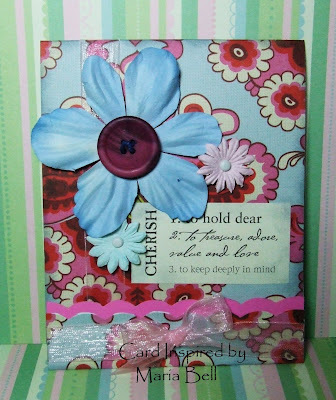 Check out the card below. . .it's another card I made with "scraps". Hey Everyone. . .2 more days left for the TIC Day #1 Challenge - 5 Layers Minimum. It's great to see the different cards sent to me that had 5 layers or more! They are all fabulous. Thank you to those who decided to participate. Scroll down to the previous post to view the different cards submitted for this challenge! This is one that I made to challenge myself too. This card was a REAL challenge for me because this card was created using remnants of stuff I had . . .you know, almost like scraps that I had in a bag of just that. . . "stuff". My goal was to create a card using 3 items from this bag (the tag, butterfly, and fibers). Well, this is what I came up with. It actually took less than 15 minutes to make. I sorta just slapped things together - like a puzzle. I think it came out okay. . . This card has 7 layers so it meets the 5 layers minimum. Good Evening Everyone! Here is Connie's submission! Such a bold and happy card! Her bee looks so cool! It looks like Connie's card has 6 layers! She did a wonderful card and her layout is great. Connie has a blog site "INKspired Treasures". Be sure to stop by and check out the details of this card. Thank you Connie for participating in first TIC!!! Good Afternoon Everyone. . . This tag is my submission for Jen's Sketch Challenge #3 at "Pieces of Me". It also fulfills my TIC. I know, that sounds a little weird but you have to admit it sounds catchy, don't you think? 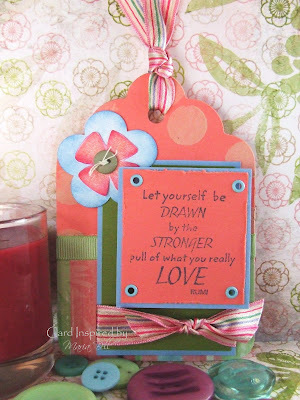 Anyway this tag was created with SU Big Bloom stamps and the sentiment is by PSX. The bigger flower is a die-cut made with my Craft Robo. The color combo is SU Cameo Coral, Brocade Blue and Old Olive. 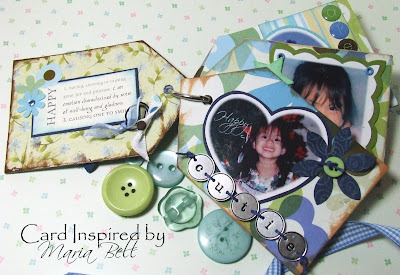 The round stamped background was made using Making Memories Foam stamp. I applied Making Memories Acrylic paint and stamped the background. 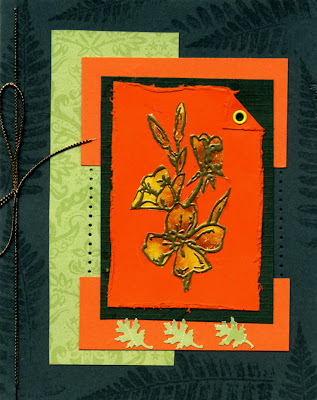 The BG paper is by Autumn Leaves and the ribbon by Basic, Basic. The button is by SU. I have another submission. This one is from Ana! Wow, she has a lot of layers! Awesome. That bear is such a cutie. I love how fuzzy it looks! 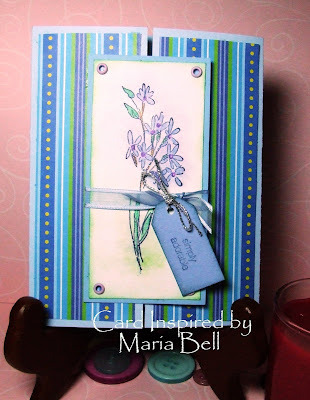 She did a wonderful job at adding all the elements on her card without it looking cluttered! Beautiful job! Ana has a gallery that you can view. . .be sure to click here to check it out! Hey GoodMorning Everyone!! Here is Jen's submission. I'm glad she decided to play! I love how Jen paper pieced Bella's pants to match her background. She did a fabulous job! I also love her layout too. I counted 6 layers on her card but if you count the stiches, she has actually 9 layers. Any embellishment that overlap one another is considered a layer. Thanks Jen for participating! I know you are a busy girl! Jen has a blog site called "Pieces of Me" and she has a sketch challenge in progress right now so be sure to check it out. The details of this card is also posted on her site. This is "my" submission for the day! Haha! Trust me this is a challenge for me too. The only way I can grow as a cardmaker and stamper is to challenge myself and experiment with different products and materials. I decided to do something different. I decided to make a card with scrapbook embellishments. This card has no stamping whatsoever! This card is a submission by Debi. This is such a stunning card with the bright and dark contrast. She also layered the card in such an interesting pattern. Great job Debi! I don't know if Debi has a blog site because she didn't give me a blog address. I need to ask her. Thank you Debi for your submission!! To the right is a card that was submitted by my friend Joyce from Oregon. I met her online and we email one another to touch base once in a while. 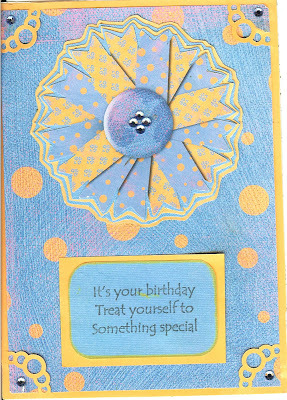 She was kind enough to send me a picture of her card that she created using multiple layers. She said that she cut each layer. . .wow, that must have been a lot of work. Well, she did a splendid job! I love the different patterns. The flower pattern reminds me of an iris fold. Thanks Joyce for your submission! Here is Tejal's submission! Isn't it cute!! Looks like she has 5 or 6 layers on her card. I think she did a wonderful job. 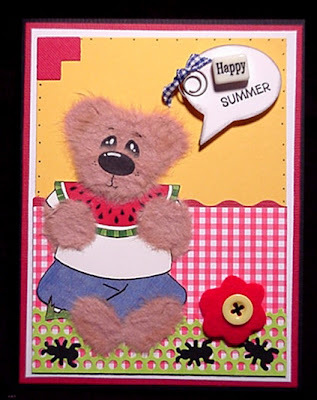 Tejal loves using "bear" stamps by what I gathered from her other lovely card creations on her blog site. 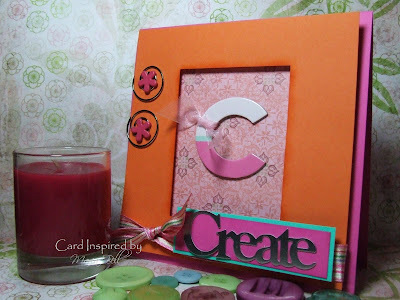 Check out her blog site "Creating New Expressions Everyday". This is the second submission to my TIC!! Isn't this card elegant? I love it, it's beautiful. This one is from Dana and her card has 7 layers! It looks like she also followed my sketch!! 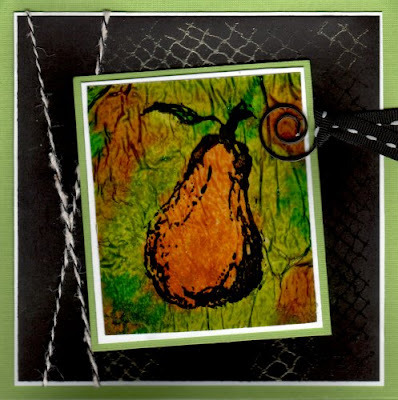 Dana has a blog site called "Kismet, Art, and Life" so be sure to visit her site for more details on this beautiful card. Thank you Dana. Wow I already have a participant of my first "TIC" (Tuesday's Inspirational Challenge). See the previous post for the details!! This first submission is from Wendy! OMG. . .this card is absolutely gorgeous! 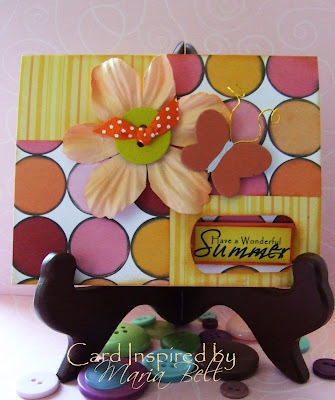 Wendy created 7 layers to create her card. 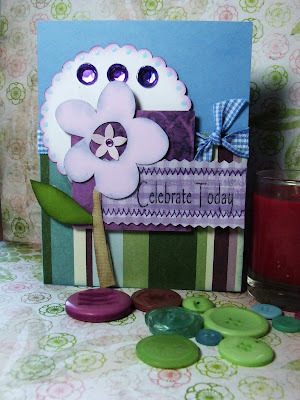 The details of this wonderful card is posted on her blog site: Crafty Butterfly Stamping Blog. 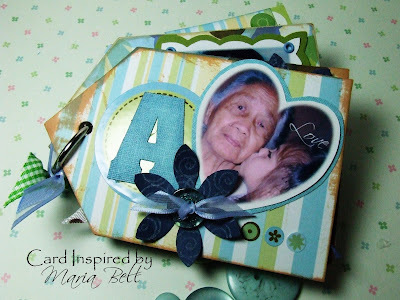 I must try the technique she used to create this card. I'll add new submissions as they come in and will move the post up to the top so everyone can see all your beautiful work! Don't feel intimated! Just do it and send it to me! All cards are beautiful! !